Starting with a pre-show on Friday and going until FOREVER (No, seriously, when does this thing end? It could legitimately go on forever), Liz will be in Canada Desert Bussing with the best of them. She will be producing the Prime Time segments (6-10pm Pacific each night) as well as the pre-show event on Friday from 6:30-8:00pm Pacific. 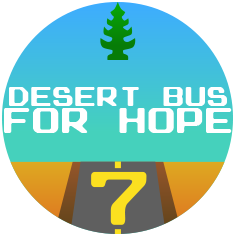 For those unfamiliar, Desert Bus For Hope is an online charity event where individuals play the game “Desert Bus” and do other various silly tasks while livestreaming 24 hours a day. This continues until donations run out. Last year it went for over 6 days and raised over $440,000. Desert Bus raises money for Child’s Play, an organization that provides toys and games to over 70 childrens’ hospitals. This organization is very near and dear to Liz’s heart, and she wrote a fantastic post about it a couple years ago. Cheer Liz and the entire Desert Bus team on by visiting desertbus.org. We can’t wait to see what will happen this year! Previous Previous post: 2nd Annual Dammit Liz Holiday Special! Next Next post: LoadingReadyRun Con!